In the aftermath of 9-11 and the aircraft hijackings, the FAA issues some directives concerning aircraft structure and modifications to make similar hijackings more difficult. One of these changes was strengthening the cockpit door. Before 9-11, the door, if it existed, was of light aluminum. It was for crew privacy more than anything else. Afterwards the door was strengthened to prevent someone from simply kicking it open. I had a thought about that door at the time. What would happen if it got stuck? Well, that’s now happened. MINNEAPOLIS (WCCO) — A Delta Air Lines flight traveling from Minneapolis-St. Paul to Las Vegas has landed safely at its destination after the pilot was unable to reenter the cockpit, according to the airline. According to a statement from Delta, prior to the plane’s final approach the captain was not able to enter the flight deck due to a door jam. The First Officer, or co-pilot, was able to then take control and land the aircraft safely without incident. “A commercial aircraft can be landed with one pilot at the control and Delta pilots are fully trained to do so if the situation were to occur,” Delta said. The door will be evaluated by Delta maintenance technicians. Frankly, I’m surprised something like this hasn’t happened before. It may have on a non-passenger or cargo flight where it would have received much less notice. The problem with strengthening the door, making it more rigid, is that airplanes aren’t rigid. They flex. On the tarmac, the wings and fuselage droop. The wings droop more with filled with fuel. In flight, the wings rise. If you look out the window in flight you can actually see the wings curve upward. The aircraft body, in flight and on the ground flexes in numerous ways. When a plane is in flight, fuel is burned, air density changes with altitude and weather. The forces and stress on the aircraft changes and the aircraft flexes. People moving around inside changes the weight and balance of the aircraft. Sometimes cargo shifts slightly. All these changes could cause the new, stronger, cockpit door to get pinched in it’s frame. If the pilot has to visit the head (the restroom for you non-military folks), a sudden change of those stresses and forces could cause the cockpit door to bind behind the pilot…locking the pilot out and locking the copilot in. The copilot is often as fully experienced as the pilot, only lacking flight hours and time in service to be bumped to pilot. In this circumstance, pity the poor copilot. The pilot is locked out, he’s locked in, and both have been swilling coffee for hours! Breaking news! Mitt Romney won’t run for Prez in 2016. Whoop! I also heard all his moneymen slithered off to back Jeb Bush. Other close advisors say Romney will support some new, unannounced candidate. Hope it’s not another RINO like Lindsay Grahamnesty. Ref yesterday’s post about the FCC. The FCC issued new regulations concerning internet speed. It actually does nothing except when it comes to reports concerning the number of people with access to “high-speed broadband internet.” When the facts don’t support the FCC’s agenda, change the labels to change the numbers to support the agenda! The Federal Communications Commission on Thursday changed the definition of broadband to increase the threshold speed – a move that has already angered cable companies. Under the Telecommunications Act of 1996, the FCC is responsible for ensuring that broadband “is being deployed to all Americans in a reasonable and timely fashion”. The FCC chairman, Tom Wheeler, had repeatedly expressed support for the proposal ahead of the vote. In his remarks at the vote meeting, he was critical of telecommunications companies including Verizon, Comcast and AT&T. He said these companies’ statements to the commission differ wildly from what they tell consumers – part of his testimony included an incredulous reading of advertisements promoting the company’s seemingly fast broadband speeds. US broadband speeds clock in as the 25th fastest in the world, according to analyst Ookla’s Net Index. Singapore, Hong Kong and Japan top the list. Countries including Finland, France and the Netherlands boast of higher speeds than the US. In reality, this change affects those broadband providers that use DSL technology instead of the faster cable based methods used by Comcast, Time-Warner, and others. Telecommunication carriers like AT&T use DSL taking advantage of their embedded facilities, often 2-wire telephone cables to individual homes. The internet speed of DSL is less the further the home is from the carrier’s local central office or remote signal amplifiers. If you read the comments by FCC Commissioner Mignon Clyburn who voted for the change, you’ll understand this is nothing more than political maneuvering to acquire more federal power over providers. “What is crystal clear to me is that the broadband speeds of yesterday are woefully inadequate today and beyond,” said Clyburn. — The UK Guardian. O’Rielly said he supports expanding broadband access but that the report relies on “intentionally flawed analysis”. He said that increasing the definition does not resolve broadband access because it does not include a plan to promote deployment in the areas lacking it. “Selecting an artificially high standard and applying it in a way that is impossible to meet in order to reach all Americans certainly in the near term makes a mockery of a process that was supposed to provide an honest assessment of broadband deployment in the United States.” — The UK Guardian. This is, in part, reminiscent of the Broadband fiasco here in Cass County—a federal solution is search of an issue. Millions wasted nation-wide on an agenda what couldn’t be supported by fact. There are methods to acquire broadband internet access where cable and DSL does not exist. Yes, it may be more expensive but it exists. The fallacy of government is to use taxpayer money to subsidize those few users. Every day another federal agency sticks its foot into the political arena supporting some liberal agenda. And every day, I make another federal agency that has proved its worthlessness. The FCC is near the top of my list. When I retired from Sprint—kicked out the door that is, one of the ‘retirement’ bennies was keeping our cell phones, for Mrs. Crucis and myself, on the employee phone plan. I used my employee discount to upgrade our cell phones to the latest one available at the time, an android smartphone. It was the best available when I retired. That was over three years ago, almost four. Times have changed. Our original smartphones only had 512mb internal memory. The ‘external’ memory card was for data storage. That amount of memory worked well for almost four years. The problem that eventually arose is that apps run in internal memory. Many—most, are loaded at startup and every one wants its piece of that internal memory. Over the years, after app update after update, those apps grew, demanding more and more memory…and that…is where the problem arose. When some of the core apps need memory, they seize it from the free, available internal memory. When there isn’t enough memory, bad things happen. Apps stop, the phone locks up, or, those apps that allow swapping internal memory with storage, grow slooow. Our new phones arrive this week. They have over 4gb internal memory and up to 64gb external storage. I hope they last another three-four years. Putin is rattling his cold-war saber. Long range Russian bombers have bee flying along the coasts of the US and now they are practicing launching long-range cruise missiles from outside the northern Canadian border. The real issue is that NORAD, the old North American Air Defense command is a shadow of its former self. In the 1950s, 1960s and 1970s, we had the DEW line (Distant Early Warning) across Alaska, Canada and Greenland. Later, we also had BMEWS (Ballistic Missile Early Warning System) that reached from Alaska to the UK. The easternmost leg of that system was in northern Scotland, the western leg ended in the Aleutian Islands. In addition to these two systems, we also had a line of over-the-horizon radar and radio intercept sites all along our northern and European borders with the old USSR. We still have capability to detect Russian incursions into our territory and to monitor them off our coasts. The real problem is that we don’t have the capability, in aircraft and bases, to defend ourselves if Putin’s practice launches, and wargames, become real. With all this in mind, What have you heard from the MSM? Russian bombers have been stalking us for some time and, whether we acknowledge it or not, Cold War II is in full force. Two Russian strategic bombers conducted practice cruise missile attacks on the United States during a training mission last week that defense officials say appeared timed to the NATO summit in Wales. 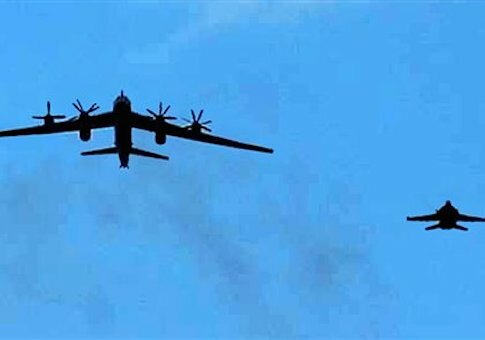 The Russian Tu-95 Bear bombers were tracked flying a route across the northern Atlantic near Iceland, Greenland, and Canada’s northeast. Last month, at least 16 bomber incursions by the Russians took place within the northwestern U.S. and Canadian air defense zones over a period 10 days. It was the largest number of incursions since the end of the Cold War. U.S. fighter jets intercepted the Russian aircraft and followed them until they exited the defense zone. And on June 20, the Russian Defense Ministry announced the test launch of six AS-15 missiles from a Bear bomber during military exercises. “Clearly, we at the U.S. Strategic Command do monitor the strategic environment,” Haney said noting large-scale nuclear exercises during the Ukraine crisis. At a time when we need real leadership in the White House and in Congress, we have neither. In times of weakness, the barbarians of the world will test us, seeking a breach in our walls. Obama, the democrats and the useless RINOs in Washington, have pulled down the few walls we had. More and more, it seems that nothing in my morning flood of news items strikes my fancy. The national division between conservatives and establishment hacks continue within the RNC. The dems continue to push for expanded welfare and open borders dividing the country between those who produce and those who are parasites, to what end? I sat next to a group a local dems earlier this week at lunch. All were in the 50s and 60s, all decried the flood of illegals streaming over out borders and Obama doing nothing to control the flood. If I hadn’t known for a fact they were dems—several have Obama-Biden stickers on their pickups, I’d have thought there were ‘Pubs. But they are not. They will continue to vote for democrats, pushing everyone like themselves, down the chute to hell and then they’ll blame everyone except themselves. The stupidity of such people continues to astound me. Welfare, Corporate Payoffs and Pork. Today’s blog title would imply democrat policies. You’d be wrong. It refers to the GOP’s House Farm Bill championed by Speaker John Boehner and our own Vicky Hartzler. Both the Senate democrats and House ‘Pubs have Farm Bills. The Senate rammed theirs past GOp opposition and brags they’ve cut the $1Trillion bill to $500Billion. The House GOP claims their version has cut more. The crux is SNAP, or Supplemental Nutrition Assistance Program. What is SNAP? Food stamps. SNAP is 80% of the cost of the Farm Bill. The supporters of the House version brag they’ve cut the Food Stamp (SNAP) program as well. How much? Three percent. Three lousy percent. The dems and ‘Pubs are wrangling over—not the actual farm and agricultural portions of the bill, small that they are. No, they’re fighting over SNAP! If SNAP is so critical, it should be removed from the Farm Bill and stand for itself. Some have advocated a change, one that I can accept IF food stamps are really necessary, is to convert the entire program to block grants and let the states create their own version of food/welfare assistance. In blue states, the money would line democrat pols pocket. Oh well, the blue staters get the government they vote for. For the moment, dems and ‘Pubs are apparently in a race to see who can waste more of our tax money. A year after they failed to pass a farm bill and suffered for it in several big congressional races, House Republicans think they’ve finally got the right balance to fund agricultural programs while weaning more Americans off food stamp benefits. Speaker John A. Boehner has thrown his weight behind bringing this year’s bill to the chamber floor, and debate kicks off on Tuesday. But House GOP leaders will have to bridge divides within the GOP, and may have to count on getting Democratic votes for passage. The Senate, led by Democrats, passed its own version last week. Both the Senate and House bills would end direct payments to farmers in favor of more extensive crop insurance programs. But the sheer size of spending contained in the bills — particularly on food stamps, which takes up 80 percent of the Senate’s five-year, $500 billion farm bill — could become a sticking point during the House debate. “The bill should be rejected outright for its price tag and its expansion of the government’s outsized and outdated role in American agriculture,” Stephen Ellis, vice president of Taxpayers for Common Sense, said Monday. The Senate passed a farm bill last week that cuts the food-stamp program — now known as the Supplemental Nutrition Assistance Program (SNAP) — by about $400 million a year, or half a percent. But the House version goes further, cutting SNAP benefits by $2 billion a year, or a little more than 3 percent, and making it more difficult for some people to qualify. Now, isn’t that great. $1Trillion of waste and the dems brag they cut $400 million, or one-half of a percent while the ‘Pubs brag they’ve cut three percent. Some GOP lawmakers say that’s still not enough, while House Democrats argue that low-income families cannot absorb the cuts. As of Monday, 134 of them had co-sponsored a resolution that asks members to reject any legislation that reduces food stamp benefits. But Americans for Prosperity, a conservative political advocacy group, said Monday it will launch an advertising blitz in a bipartisan slate of 15 congressional districts, including Mr. Boehner‘s, that takes aim at the House bill. The group says the bill is bloated by food-stamp spending and that “well-connected corporations” will get the rest of the funds. Last year, Mr. Boehner declined to bring a farm bill to the House floor to avoid a nasty intraparty fight ahead of the November elections, as farm state Republicans pushed for crop subsidies while other GOP conservatives demanded widespread cuts. — Washington Times. The establishment ‘Pubs who support this welfare bill shouldn’t be concerned what their dem congressional friends think of the Food Stamp Welfare bill. No, they should be more concerned what their constituents think. The next congressional primary is only a year away. Pubbies, vote for this and I can guarantee you’ll have primary opposition next year. I’m already hearing increasing rumbles of discontent. There are so many items to post about today that it’s almost overwhelming. Where shall we start? How about some bullet items. Obama ignores D-Day remembrance for 2nd year in a row. NJ Gov. Christie attempts to dodge bullet by appointing ‘Pub AG to replace Lautenberg. AG says won’t run for office in October. Christie is attempting to get the best of both worlds. He placates the ‘Pubs by appointing a “conservative” to temporary replace Lautenberg, and he placates his dem contributors by selecting a appointee who won’t run for the election thereby almost guaranteeing a dem senate after the October elections. WaPo calls Obama, Goerge W. Obama, and NYT says Obama has lost all credibility, then retracts part of the editorial. The NYT has a real journalism moment…for a moment, before reverting to their old Obama shill stance. WaPo, however, is shifting more and more against Obama and so far, they are not retracting their statements. From my observation, the AP surveillance scandal was the trigger. Detroit cops stage a purse-snatching and then are almost shot by an off-duty FBI agent. Just when you think Detroit can get worse, it does. NFL Superbowl Champ refuses to attend WH ceremony over Obama’s support for Planned Parenthood. Finally, a celeb with morals, guts and a brain! WaPo columnist declares Drudge was Right! Refers to Drudge’s speech fifteen years ago on the state of Journalism. As you can see, there are numerous subjects for a post. However, everyone is focused on the revelation that the NSA has been seizing call data for ALL (I’m still not sure that is accurate,) Verizon subscribers—and Verizon isn’t the only carrier involved! What people are overlooking, is that this isn’t new. What is new is the volume of the data and the scope of the data seized. The movies have misrepresented call tracing since the advent of the digital switch. Way back in the ’30s and ’40s, telephone switches were analog. In order to trace a call, you can to follow, trace a call, through the internal connections of the switch. It was a slow and laborious process. With the advent and deployment of digital switches and modern call routing techniques, it’s much, much easier. A call detail record is created when the call is dialed. More data is added when the connection is made and additional data, timestamps, is added until the call is terminated. If either the originating or destination number is known, a carrier can retrieve the call data in seconds—a minute or two at most. What is NOT available is the conversation. You see, when digital switches were deployed in the ’60s and ’70s, the audio of the calls were digitalized, compressed, to better utilize and manage the telephone circuits between switches. If you tapped in on a circuit, you’d hear nothing. It’s digital data, not analog audio. The only place to tap is what is known as “the last mile,” the circuit between your home and the local switch. When wiretaps were granted, the taps had to be placed at or near the subject’s premises. Digital central office and long distance switches weren’t designed to enable tapping and many, most perhaps, still aren’t. It’s extremely difficult. The FedGov, using FISA, asked the major telco carriers, in the early years of the 21st Century, to develop switches to enable tapping and to retrofit existing switches. It would be extremely expensive to retrofit the deployed switches and the carriers told to FedGov to pound sand. The carriers did, as new switches were added and older switches replaced for added capacity, comply with the FedGov’s directives. Eventually, their networks will be replaced with switches that will have the capability of listening in on live conversations—but that time is still in the future. The transition will continue for several years, maybe a decade or more. Businesses just won’t replace a large, significant portion of their infrastructure at a whim of bureaucrats. The expense would put them out of business. However, the FedGov has carriers over a barrel…and a club called the FCC. The FCC licenses telecommunications carriers and using the threat to withdraw that license, can coerce the carriers into doing whatever the Feds want—within some fiscal reason. That’s why the transition has and will take significant time. So, we have a reprieve for awhile. I don’t know how long. Years, maybe? A decade, possibly? We must put that time into good use. First, by electing a CONSERVATIVE congress. Next, repeal the Patriot ACT and disband DHS, or, failing that, severely curtail their power and scope. It’s not too late…yet, if we are to preserve out liberty.